The Music Manual: Elephant Stone release album teaser track, Manipulator ahead of latest album, Ship of Fools. Elephant Stone release album teaser track, Manipulator ahead of latest album, Ship of Fools. IS music expressionism? The Music Manual asked Elephant Stone front-man Rishi Dhir in 2014. "I'd like to think of what Elephant Stone does as expressionist. "Music to me is pure expression of meaning and emotion. "Reality plays no role in the music I make." The Montreal trio have now released the epitome of expressionism - their latest single, Manipulator. 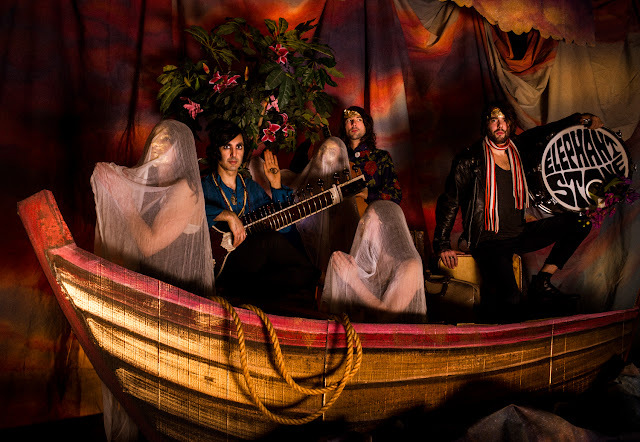 Starting life back in 2009, Elephant Stone was the brainchild of front-man Rishi Dhir, following the quest of bringing the classical Indian soundtrack into the alternative rock industry - just as the likes of George Harrison had done previously. Taken from their fourth full-length LP Ship of Fools, out digitally on 16th September, Manipulator has hip shaking and mind moving qualities which overpower its explanation on paper. Its infectious tonality and somewhat pop sounding background noise gives the single a different twist to their previous hindie rock material. A definitive signal of artistic growth, is the bare bones of this kaleidoscopic fable, totally summed up within Dhir's psychedelic vocalism, wrapped up in a blanket of backing vocals from guitarist Gabriel Lambert and drummer Miles Dupire. After this challenging teaser, pre-order your copy of Ship of Fools here.